Nearly five years to the day after Joel Salatin of Polyface inspired us to be farmers just down the road at the Lake House in Daylesford, that wonderful man rolled up our driveway to see what we’ve done and gave us a huge thumbs up. Over three evenings hosted in collaboration with Ben Falloon of Taranaki Farm, we held agrarian salons where we shared our journey and our ethically-viable no-growth model as Joel listened and then offered his feedback and trademark heretical take on the industrial food system. Is there anything more gratifying than affirmation from our most respected teachers? I couldn’t stop smiling for a week, and now I have the privilege of visiting Joel again at Polyface after going to the Slow Meat symposium in Denver next month, a trip of research and advocacy that culminates with lunch with another advocate I hold in great esteem, Michael Pollan. After sharing our story repeatedly while Joel was here and at our many workshops, I thought I’d get it onto the page for everyone to read, whether you can visit us or not. We hope that sharing our story helps to inspire more people to make that leap and join the fair food farming revolution. As I’ve written elsewhere, we grew tired of choosing between savouring and saving the world, so came to the land to be regenerative, ethical farmers of pastured pigs. I was formerly an academic in cultural studies, chronically ‘nearing completion’ of a PhD, and taught at the University of Melbourne and Southern Cross University. My focus specifically was culinary cosmopolitanism. I am also a former vegetarian of seven years. I loved my work and study, but I needed to produce something more tangible than words for a select few. Stuart was a business development manager for a venture capitalist firm out of Singapore. With a background in building, he’d found himself in a series of coordinator and management positions that left him desperate for fresh air and handyman projects every time he cycled home to our many farm-like suburban backyards. In 2010, Joel inspired us to take our obsessive DIY-ism, our love of horizons, and our deep desire to produce and contribute meaningfully to a fairer food system to a life of farming. So in 2011, we packed up our suburban lives, took a four-month detour to eat and learn our way across America, and landed on 69 acres of volcanic soils of Eganstown, just outside the popular gastronomic destination of Daylesford, Victoria. We now run a small herd of Large Black rare breed pigs entirely on the paddocks – just 12 sows and 2 boars, which means a total herd of around 110 at any time. We also have a small herd of cattle – a mixture usually of Lowlines and Murray Greys, though I think we’ll stick with Murray Greys in future as we need the bigger carcass to meet demand without running more cattle. In production terms, that means we process 16 pigs and 1 steer per month. But more on that in Part 2 of this Grow Your Ethics series. We chose Large Blacks for a few reasons. 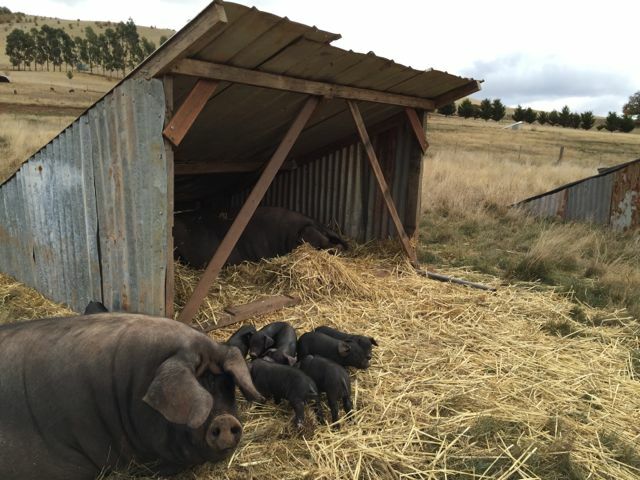 There are eight breeds of pigs in Australia, and Large Blacks are among the rarest. They’re a very slow-growing breed, renowned for farrowing big litters and being excellent mothers, as well as for being quite docile, probably due to their beautiful long ears that mostly obscure their vision! We wanted to contribute to the rare breeds movement to save these old breeds from extinction by growing them commercially, and as new farmers with three young children we loved the sound of a docile pig. The cattle production model is pretty conventional set stocking, but very different to most Australian beef production as we grow mature animals and dry age the carcasses. We don’t over-stock, which means we don’t have to bring in feed. We buy in steers between 18 and 30 months old then grow them on for another six to 12 months so that we’re slaughtering between three and four years old. By that stage the meat has developed a rich, deep flavour and colour, and dry ageing tenderises and deepens the flavour even further. We credit our decision to grow mature animals and dry age them to Warialda Beef – their Belted Galloways are out of this world and we’re grateful for their openness about their own system that enabled us to do something similar. Our pigs are fed a diet mostly of beer porridge – spent brewers’ grain from the local Holgate Brewhouse mixed with milk from Jonesy’s Dairy. That’s supplemented by what they eat from the paddocks, which we’re working to diversify to include not just the rye paddocks we inherited, but also brassicas, turnips, sweetbeets, sunflowers, barley, lupins, and millet. They also still receive a small ration of pelletised grains – wheat, barley & lupins. Ours is a custom mix we had to work with our feed supplier to obtain as most commercial pig feed contains soy, which is 80% likely to be GM, sub-therapeutic antibiotics, and post-industrial food waste - basically smarties off the factory floor. We’re seeking to eradicate the need to bring any purpose-grown animal feed onto the property. The sows are kept in pairs at all times. This means they don’t have to sort out their social dynamics by changing who they’re with, and it also means they’re never alone as pigs are very social creatures. Further, it provides an auntie for nursing if one litter is bigger than the other. They go in with the boar together, farrow within 24 hours of each other usually, and then we wean their litters together at 6-8 weeks. They farrow (give birth) out in the paddocks – we put deep litter into their houses, which encourages the sows to nest inside the shelter. That serves to keep the piglets warm in the colder months, but also protects them from foxes. The deep litter also provides a measure of protection from squashing – we lose 10-15% of piglets to squashing, which is similar to the intensive pig industry’s stats even in systems where the sows are confined in crates through and after farrowing. We castrate our male piglets before 21 days. You can see the whole discussion of that decision here. To be brief, we had issues with boar taint and unwanted teen pregnancies before we started castrating. Castration enables us to leave the pigs in family groups right up until slaughtering age between 6 and 8 months for market-sized pigs, and 12-18 months for salami pigs. We also made the decision to vaccinate after an initial period where we didn’t. This decision was also chronicled during our six months on Bush Tele following a piglet (Wilbur 101) from paddock to plate. In short, we decided that although the risk of disease in our tiny herd is very low, the consequences could be too high. So the breeding herd are all routinely vaccinated, and the growers are immunized through the sows’ colostrum. As for paddock management, we’re basically running a set stocking system and pushing pigs off higher use areas with single-line electric as they expose the soil. This means we can leave the pigs in bigger paddocks (1-3 acres) that gradually get smaller as we push them away from the fence line, until such time as they return to the start after some six months or so. 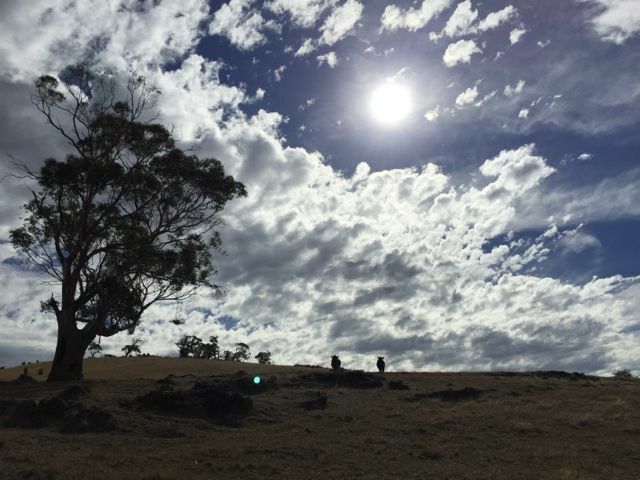 We reckon we still have a lot to learn about best practice rotations, but we’re proud that we never have bare paddocks – we work hard to ensure we have cover year round. When it’s time for slaughter, we load the pigs onto a large stock trailer with a rubber mat and loose hay and give them access to water until the hour-long drive to the abattoir. Our pigs are offloaded and go straight through to the kill floor – they’re not held amongst the large groups of industrially-raised pigs that are also slaughtered at our abattoir. They enter a gondola three at a time, which is then lowered into a carbon dioxide chamber where they are rendered unconscious in less than 30 seconds. Once fully unconscious, the pigs are stuck and bled out before continuing down the line for de-hairing, evisceration, etc. Our abattoir has always been very open and transparent about their practices, so although we would prefer on-farm slaughter or even a small, regional abattoir that only dealt with smaller batches of animals, we are happy with what we have access to right now. We regularly tour the abattoir and witness the professionalism and careful handling of the animals pre-slaughter. The carcasses are transported back to our on-farm meatsmith the day after slaughter, where I, my meat grrls, and assorted other volunteers transform them into a range of uncommonly delicious cuts. In the next instalment of Grow Your Ethics, I’ll detail our miniscule supply chain and direct sales model. In Part Three, I’ll return to the farm’s philosophy, including our ‘ethically viable no-growth model’ and future plans to ensure we’re doing our utmost to respect the pigness of the pig while regenerating our landscape. If you want more detail and encouragement to grow your ethics on your own piece of land somewhere (served with some uncommonly delicious produce from us and other lovely local growers like Angelica Organics and Captains Creek), you might like our one-day Grow Your Ethics workshops. Hope to see you on the farm soon!